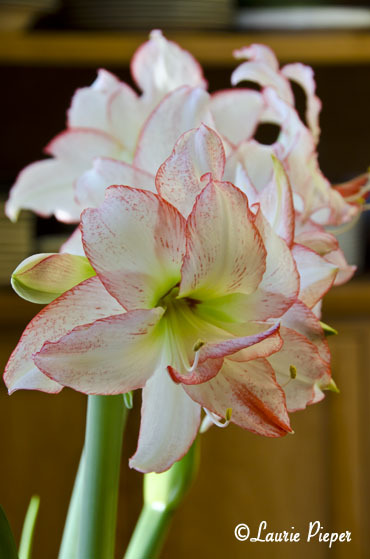 I ordered some Amaryllis bulbs early in the Fall in the hopes that they would be in bloom for Thanksgiving. Somehow, I timed it just right. It’s always so nice when things work out that way. 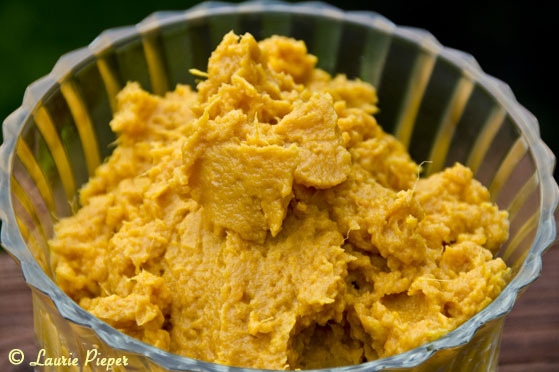 One of the side dishes that I will be preparing on Thursday is Bourbon Mashed Sweet Potatoes. The recipe was sent to me by one of our guests. It’s delicious. I tested it out this summer while I was visiting my mother. (1) Pierce sweet potatoes with a fork. Cook in microwave until tender or wrap in buttered aluminum foil and bake at 425 degrees for 45 to 60 minutes or until tender. (2) Remove sweet potatoes from their skins. Mash together with the remaining ingredients, making adjustments as needed to achieve desired flavor and consistency. * Note: the alcohol is not “cooked out” in this recipe. Another one of the side dishes that I’ll be serving is my Cranberry Compote, which I make every year. I prepared the base this morning (photo below) and will add fresh apple just before serving on Thursday. (1) In a medium pot, stir together granulated sugar, water, cloves, allspice and cinnamon sticks. Bring to a boil over medium heat. Reduce heat to low so that they syrup is barely at a simmer. Cook 10 minutes. Carefully remove spices. 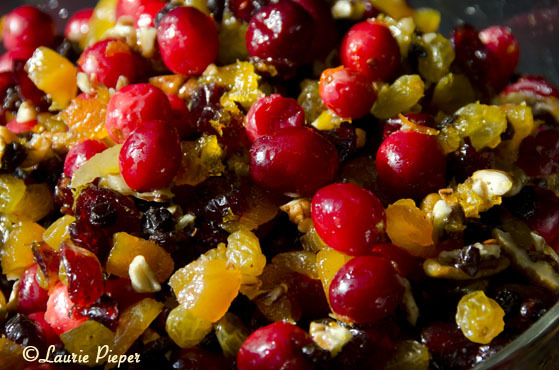 (2) Add dried cranberries, apricots and raisins, currants or dates to sugar syrup. Bring dried fruits to a simmer and cook for 5 minutes. Stir in cranberries, pecans and orange zest. Cover. Remove from heat. Let sit 5 to 10 minutes. The cranberries should just begin to pop. If they do not, you may need to return the pot to a low heat for a few minutes. (3) Serve warm or chill before serving. If desired, stir in apple, pear or orange right before serving. Note: Cranberry Compote is very versatile. It can be served on its own, mixed into yogurt, or mixed with maple syrup, warmed and served over French Toast. For Thanksgiving, I will be serving it as a chilled side dish. Now, I’m off to do some more cooking! I’ll try to do a Thanksgiving Preparation, Part II tomorrow or Thursday morn. Just in case I don’t manage to get another post in before the holiday, Happy Thanksgiving!! !